At Abu Jani Sandeep Khosla’s store launch, Shweta was photographed lending her support in an outfit by the designer duo. Assorted bracelets aside, she rounded out the look with a rather delicate necklace and a Bulgari ‘Serpenti’ watch. For her school’s annual day functions, Nita picked two festive suits to wear. 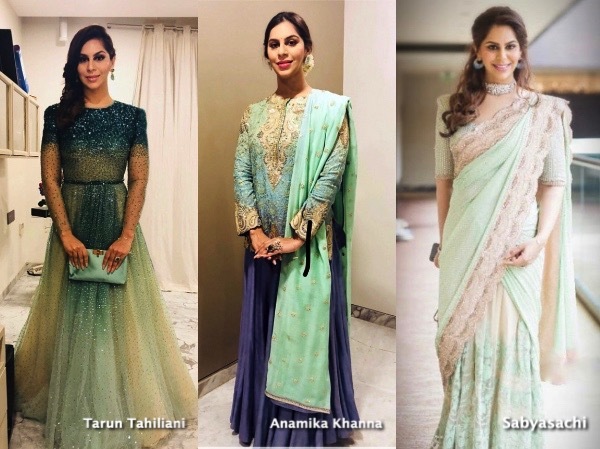 Between the metallic (a Sabyasachi we think) and the pink (an Abu Jani Sandeep Khosla? ), which was your favorite on her? Natasha opted for an orange Abu Jani Sandeep Khosla lehenga to wear to Arpita’s Diwali party pairing it with a crystal box clutch and a maang tikka. Unfortunately, between the color of the lehenga, the design of the top and the maang tikka, the look felt too costumey. Who else is suddenly craving an orange chuski?